From the governor's office: "Governor Andrew M. Cuomo today [Monday] departed for Puerto Rico with a New York delegation that will discuss the Puerto Rican government's ongoing healthcare crisis and economic challenges. The Governor and the delegation will be meeting with Puerto Rican officials and will also be discussing the need for Washington to take action to help Puerto Rico." The trip is a quick one-night visit and the delegation includes, in part: New York City Council Speaker Melissa Mark-Viverito; Attorney General Eric Schneiderman; Assembly Speaker Carl Heastie; Assemblyman Marcos Crespo; Bronx Borough President Rubén Díaz, Jr.; New York City Comptroller Scott Stringer; Congressman Charles Rangel; and Congresswoman Nydia Velázquez. Cuomo said on the plane to Puerto Rico that the island should be allowed to file bankruptcy and restructure its debt - the first time he has indicated a position. Cuomo has been criticized for the large campaign contributions he receives from finance industry leaders who hold Puerto Rican debt. Noticeably absent from the trip is state Comptroller Tom DiNapoli, who reportedly received an invitation after the trip was announced. And, many have pointed out, of course, that Mayor Bill de Blasio is not on the trip - de Blasio's office said that he had not been invited, Cuomo said it didn't make sense to bring the mayor. TRACKING DE BLASIO: Meanwhile, de Blasio went to Connecticut again on Friday, visiting with his son Dante, who is now a Yale freshman, for Dante's birthday. De Blasio returned to New York City, but did not have public events on Saturday or Sunday. On Monday, de Blasio attended and gave remarks at the West Indian American Day Carnival Association Breakfast and then marched in the West Indian American Day Carnival Association Labor Day Parade. De Blasio and Cuomo did not interact at the parade, though both addressed the overnight shooting of a Cuomo administration official, Carey Gabay, who was the victim of a stray bullet in Brooklyn late Saturday night. After the parade Monday, de Blasio visited the hospital where Gabay is being treated. Cuomo also visited with Gabay's family at the hospital. Coming up: on Tuesday morning on MSNBC: "In a rare joint interview, New York City Mayor Bill de Blasio and his wife, First Lady Chirlane McCray, will appear on MSNBC's "Morning Joe." The live in-studio interview is on Tuesday, September 8 during the 7 a.m. ET hour of "Morning Joe." They will discuss education, crime, homelessness, mental health and the 2016 presidential race." Also on Tuesday, in the evening, the mayor will deliver remarks at the 2015 West Indian American and Caribbean American Heritage Reception, and he will appear in a taped interview on Telemundo in which he'll discuss Pope Francis' upcoming visit to New York. On Thursday afternoon at Pace University, de Blasio will appear at an event being hosted by his national progressive group, The Progressive Agenda: "Hedge Fund Billionaires vs. Kindergarten Teachers: Whose side are you on?" OTHERWISE: It's back-to-school week for the large majority of New York City students, even though some at charter schools have already begun the school year. Keep an eye out for major themes of this educational year: how does year two of de Blasio's pre-K program go now that 70,000-plus children are involved? Is progress being made at the city's most struggling schools? Relatedly, how is the community schools initiative going? The New York City Council will surely look at some of these educational issues over the course of the coming months. The Council returns to more active duty this week, beginning what promises to be a busy fall of oversight and legislative hearings. Thursday is primary election day, with many races happening around the city, mostly for hyperlocal positions like District Leader. One key result to watch is in the crowded Democratic primary to fill a vacant Queens City Council seat (Mark Weprin resigned this spring to take a job with Governor Cuomo). Our look at the many voting opportunities - starting Thursday - for New Yorkers over the next 14 months. On Thursday, Vice President Joe Biden is due back in New York City, this time for an event "addressing the national backlog of sexual assault kits" and an "event on the economy." It is likely that Manhattan DA Cy Vance will be a key part of the former and that Governor Cuomo will be involved with one, if not both. Speaking of Cuomo, keep an eye out for a state Senate hearing this Thursday that will examine the process by which Cuomo's fast food wage board did its work this spring. Friday is the 14th anniversary of the September 11, 2001 terrorist attacks that hit New York City and elsewhere. There will be commemorative events on and around the 11th. The 7-train extension to the far West Side will open on Sunday. Former Mayor Bloomberg will not be in attendance. It is unclear at this time if Gov. Cuomo will be there, one would expect Mayor de Blasio to be, but who knows. De Blasio is due on MSNBC's Morning Joe Tuesday morning. "In the evening, the Mayor and First Lady will attend the 2015 West Indian American and Caribbean American Heritage Reception, where the Mayor will deliver remarks...The Mayor will also appear on Telemundo in an interview with Anchor Ricardo Villarini to discuss Pope Francis's upcoming visit. Note: This is a taped interview that will air during the 6 pm and 11 pm hours." On WNYC's Brian Lehrer Show Tuesday morning: "Chancellor Fariña on the New School Year" at approximately 10:50 a.m. "New York City schools chancellor Carmen Fariña talks about what's changed and how best for kids, parents, teachers and administrators to approach the new beginning." 10 a.m., the Committee on Environmental Protection will see a bill introduced that would prohibit small stores from propping their door(s) open when the air conditioning is on. 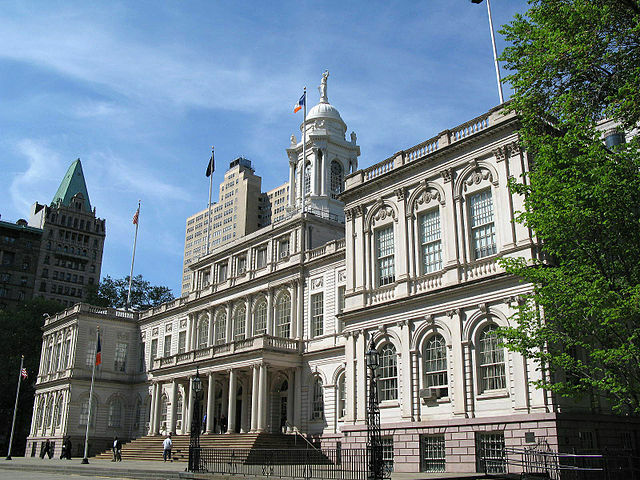 11 a.m., the Subcommittee on Landmarks, Public Siting and Maritime Uses will consider several land use applications from City Council Member David Greenfield of Brooklyn. On Tuesday at 9 a.m. the NYC Board of Corrections will have a public board meeting. There is a 15 minute "public comment period" at the end of the session. At 11 a.m. Senator Brad Hoylman and Assembly Member Deborah Glick, both Manhattan Democrats, join forces with women's advocacy organizations and others to hold a press conference "to announce legislation requiring state contractors to disclose data on their gender wage gaps." Public Advocate Letitia James, NOW-NYS, A Better Balance, Eleanor's Legacy, PowHer NY, the Fiscal Policy Institute, and other various elected officials and stakeholders will attend. At 1:30 p.m. the NYC Jails Action Coalition (JAC) will hold a press conference at City Hall with City Council members, faith leaders, children and families of incarcerated individuals, and other criminal justice advocates. Speakers will include Johnny Perez of NYC Jails Action Coalition, Council Members Daniel Dromm and Ydanis Rodriguez, and Julia L. Davis of Children's Rights, among others. At 6:30 p.m. City and State NY will hold a reception to celebrate the launch of the publication's special Manhattan issue. A variety of Manhattan elected officials will attend. 10 a.m., the Committee on Youth Services will have an oversight hearing to assess the "goals of the City's youth mentoring program" and whether or not they are being met. 10 a.m., the Committee on Civil Service and Labor is scheduled to meet. 1 p.m.. the Committee on Rules, Privileges and Elections meets to approve the appointment of Shampa Chanda to the New York City Board of Standards and Appeals, and to discuss the possible appointments of Helen Arteaga to the New York City Health and Hospitals Corporation Board of Directors, and re-appointment of Arva R. Rice to the Council to the New York City Equal Employment Practices Commission. "On Wednesday, September 9th, New York City Council Speaker Melissa Mark-Viverito, Council Member Rafael Espinal, the Council Jewish Caucus and nearly 100 Holocaust Survivors will join community leaders to commemorate the restoration of a recently discovered Torah Scroll which was hidden for over 70 years in Poland. The event will also recognize the Council's efforts to help our city's Holocaust survivors who are living in poverty with the allocation of $1.5 million in funding though the Survivors Initiative." In Albany on Wednesday at 1 p.m., the Senate Standing Committee on Racing, Gaming, and Wagering will hold a public hearing "to discuss the future of online poker in New York State." On Wednesday at 9:30 a.m., the city Department of Consumer Affairs will continue its workshop series to help "employers understand their responsibilities under the Paid Sick Leave Law." At 12:30 p.m. Wednesday, Comptroller Scott Stringer and AARP NY are hosting a fraud protection workshop at the Swinging Sixties Senior Center. At 6:30 p.m. the New York City Civilian Complaint Review Board (CCRB) will hold a public board meeting to field complaints about and recommend action against abusive police tactics. Thursday, September 10th is 2015 Primary Day in New York City. There are nominations for the following positions: Judge of the Civil Court District, Female District Leader, Male District Leader, Delegate to Judicial Convention, Alternate Delegate to the Judicial Convention, and County Committee. There's also the hotly contested Democratic Primary for City Council in Queens District 23. See a full list of candidates for all offices here. And read our look at how this is the first of many opportunities - too many? - for New Yorkers to vote over the next 14 months, culminating with the presidential election next year. On Thursday, Vice President Joe Biden is due back in New York City, this time for an event "addressing the national backlog of sexual assault kits" and an "event on the economy." The next public meeting of the New York City Campaign Finance Board will be held on Thursday, September 10 at 10 a.m. In Albany on Thursday at 11 a.m., the Senate Standing Committee on Labor will hold a public hearing to "examine the overall process of the Fast Food Wage Board of 2015." On Thursday at 12:00 p.m. #YesWeCode and the Office of New York State Assembly Member Michael Blake (D-Bronx) will join forces for "New Faces of Tech in the Bronx." In a one-hour special titled "Growing Hope Live from the Bronx," MSNBC will provide live coverage of the event at 2 p.m. MSNBC's program will include interviews with Blake, New York City Chief Technology Officer Minerva Tantoco and Van Jones, founder of #YesWeCode. On Thursday at 12:30 p.m. "NYC Comptroller Scott Stringer and a panel of experts and advocates will join AARP to develop strategies for closing a federal legal loophole that allows bad-acting financial advisers to promote retirement investments that net them high commissions at the expense of clients' savings." Panel members include Ali Khawar, Counselor to the U.S. Secretary of Labor, Scott Evans, New York City Deputy Comptroller for Asset Management and Chief Investment Officer and Kathleen McBride, Chair of The Committee for the Fiduciary Standard. At 4:30 p.m. Thursday at Pace University, it is, "Hedge Fund Billionaires vs. Kindergarten Teachers: Whose side are you on? ", an event featuring Mayor de Blasio. "Did you know that the top 25 hedge fund managers in the United States make more than every single kindergarten teacher in the country—combined? There are a lot of reasons that the math shakes out so unfairly, but one of them is the carried-interest loophole, a tax law that essentially gives these one-percenters a much lower tax rate than they should be paying. On Thursday, September 10 at 4:30 p.m., director Robert Greenwald will premier his new short film that examines this problem and advocates for the clear solution. The screening will include a live conversation and Q&A with Robert and with New York City Mayor Bill de Blasio—and we'd like you to join us." At 6:30 p.m. Thursday at The New School, urban policy professor Jeff Smith will read from his new book "Mr. Smith Goes to Prison: What My Year Behind Bars Taught Me About America's Prison Crisis." After Smith's presentation, Touré, author of Who's Afraid of Post-Blackness?, will moderate a discussion about criminal justice reform with Professor Smith, Soffiyah Elijah (Executive Director of Correctional Association of New York), Dr. Carla Shedd (Columbia University sociologist), and Melissa Mark Viverito (New York City Council Speaker). At 7:00 p.m. New York City is hosting a public hearing to "solicit community input" on future development projects in Lower Manhattan. The developments focus on coastal and storm protection measures and upgrades to affordable housing units. Friday is the 14th anniversary of the September 11, 2001 terrorist attacks on New York City and elsewhere in the United States. On Friday at 8:15 a.m., New York Law School Dean Anthony W. Crowell will moderate a panel on New York City's lawyers response to 9/11, as part of City Law's Breakfast Series. Participants include city officials who were in office at the time of the attacks. Their names and (former) positions are as follows: Jeffrey D. Friedlander, Law Department; Steven Fishner, Criminal Justice Coordinator; Marjorie Landa, Law Department; Bryan Grimaldi, Mayor's Office; and Florence Hutner, Law Department. On Friday at 6:30 p.m., Staten Island will host its annual Postcards Memorial Ceremony to commemorate the lost lives of Staten Islanders on September 11, 2001 and its aftermath. Borough President James Oddo, who will help lead the event, calls it "an opportunity for us to come together as one community and to show the families that even though it is 14 years later, we remain committed to honoring the memories of those who have lost." On Saturday starting at 10 a.m., New York City will hold its annual Labor Day Parade. The procession will start at 5th Avenue and 44th Street and march up to 67th street before stoping. George Gresham, President of 1199 SEIU, will be Grand Marshal and George Miranda, President of IBT Joint Council 16, will be Parade Chair. On Saturday, Brooklyn District Attorney Ken Thompson is holding another "Begin Again" event. New Yorkers with outstanding summonses and open arrest warrants will receive a Legal Aid attorney and a hearing in front of a judge. Read our story on Thompson's Begin Again initiative and its place in the larger justice reform conversation. On Sunday, after a nearly two-year delay, the new 7-train extension to the far west side of Manhattan will open. The expansion, undertaken in conjunction with the Hudson Yards Redevelopment Project, extends the subway line from 42nd Street Times Square to the new 34th Street-Hudson Yards station. The first train will depart from the station at 1:07 p.m.